I. Continued Fractions. Since these play an important role, the first chapter introduces their basic properties, evaluation algorithms and convergence theorems. From the section dealing with convergence it can be seen that in certain situations nonlinear approximations are more powerful than linear approximations. The recent notion of branched continued fraction is introduced in the multivariate section and is later used for the construction of multivariate rational interpolants. II. Padé Approximants. A survey of the theory of these local rational approximants for a given function is presented, including the problems of existence, unicity and computation. Also considered are the convergence of sequences of Padé approximants and the continuity of the Padé operator which associates with a function its Padé approximant of a certain order. A special section is devoted to the multivariate case. III. Rational Interpolants. These rational functions fit a given function at some given points. Many results of the previous chapter remain valid for this more general case where the interpolation conditions are spread over several points. In between the rational interpolation case and Padé approximation case lies the theory of rational Hermite interpolation where each interpolation point can be assigned more than one interpolation condition. Some results on the convergence of sequences of rational Hermite interpolants are mentioned and multivariate rational interpolants are introduced in two different ways. IV. Applications. The previous types of rational approximants are used here to develop several numerical methods for the solution of classical problems such as convergence acceleration, nonlinear equations, ordinary differential equations, numerical quadrature, partial differential equations and integral equations. Many numerical examples illustrate the different techniques, and it is seen that nonlinear methods are very useful in situations involving singularities. 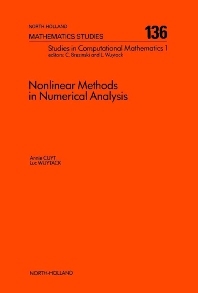 While most textbooks on Numerical Analysis discuss linear techniques for the solution of various numerical problems, this book introduces and illustrates nonlinear methods. It presents several nonlinear techniques resulting mainly from the use of Padé approximants and rational interpolants.